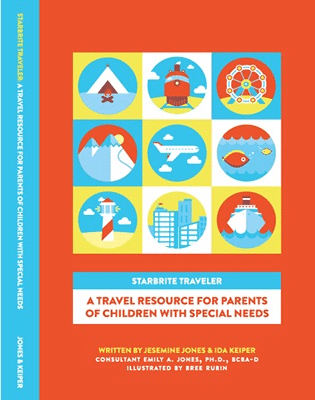 Our first book, Starbrite Traveler: A Travel Resource for Parents of Children with Special Needs is an illustrated guide for parents, caregivers, family members, friends, and educators of children with special needs that gives families a well-organized, confidence building, easy to read, travel resource. This guide holds the reader’s hand every step of the way, from dreaming about travel to arriving at their destination. To plan an amazing trip for your family, follow the 5 D’s of travel: Dream, Determine, Dry Run, Depart, and Destinations. In Chapter 3, Dry Run: Pre-Travel Rehearsal we discuss common travel concerns for children with special needs especially autism spectrum disorders and sensory concerns. Topics include vacation anticipation, going through airport security, flying on an airplane, sleeping in a different bed, transitioning from one activity to another, overstimulation at attractions, waiting, eating at restaurants, following the routine, interacting with others, staying safe, and more. For each area of concern, suggested strategies help prepare you and your child for vacation. The strategies have an evidence-base to change behavior and/or teach new skills to children. Strategies include choice making, visual stories, modeling and practice, visual schedules, relaxation techniques, and visual scripts to name a few. We walk you through the steps to apply the strategy and provide activities to practice with your child before and during your vacation. To address safety, we include interactive illustrated scenarios and activities to teach and reinforce safety with your child. 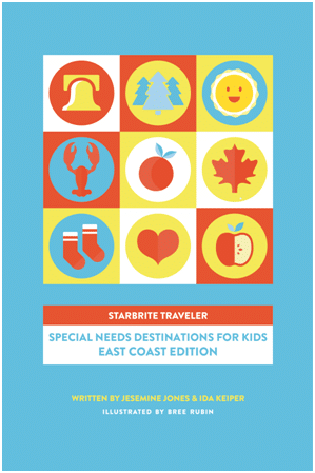 Our second book, Starbrite Traveler: Destinations for Kids with Special Needs – East Coast Edition, available at the end of July is a resource to aid parents, caregivers, family members, friends, and educators of children with special needs to help them choose special needs friendly destinations along the East Coast of the United States. In addition, we include fun activities and travel games to do with your child before vacation, on vacation, and after vacation to enhance their academic, social, and life skills. Special needs friendly destinations for the entire family, including zoos, museums, aquariums, discovery/science centers, beaches, planetariums, amusement/theme parks, and state and national parks. Accessible accommodations, programs, and supports provided for children with developmental disorders, autism, physical disabilities, visual impairments and/or who are deaf or hard of hearing. ArtAccess at Queens Museum of Art offer children with developmental disabilities hands on art experience. Adaptive Ski Programs are available throughout the country for children with autism, physical disabilities and/or visually impairments. Swim with the Dolphins for a therapeutic experience for children with developmental disorders. Intrepid Sea, Air, and Space Museum offer monthly Family Program tours and art activities for children with developmental and/or learning disabilities. Metropolitan Museum of Art offer children who are blind or partially sighted special art programs and descriptive tours. The above are just a small sample of the outstanding programs we have found along the East Coast of the United States. We are dedicated to providing families of children with special needs the help and support needed to make travel not only possible, but a rewarding and enriching experience. We believe all children should be afforded the same opportunity to travel, see new places, and enjoy enriching experiences.